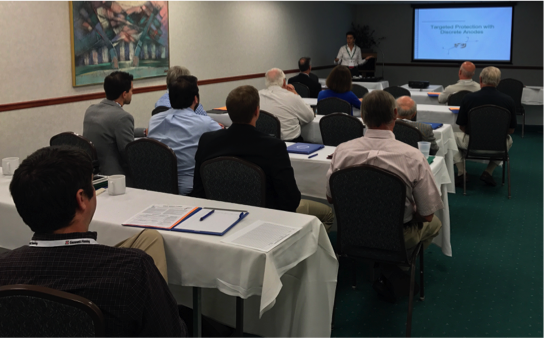 Earlier this year, on August 24, 2017, ASCE’s Continuing Education Committee partnered with ESWP (Engineers’ Society of Western Pennsylvania) to provide all local Professional Engineers a full day’s worth of courses from which to earn up to 7.5 PDHs (Professional Development Hours) for the upcoming Pennsylvania Professional Engineer License Renewal deadline (September 30, 2017). The Pennsylvania State Board of Professional Engineers, Land Surveyors and Geologists requires Professional Engineers to obtain 24 PDH units during the biennial renewal period. 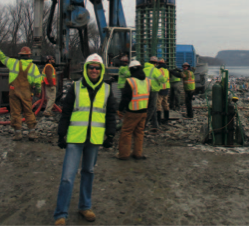 For more information on Pennsylvania’s Professional Engineer requirements, please see the Continuing Education Made Easy Blog at http://www.asce-pgh.org/page-1812230 by Sam Shamsi. This day-long event allowed attendees the opportunity to attend up to seven lectures, offered under three concurrent breakout sessions. Attendees could choose a full-day registration, or just the morning, or afternoon session. The morning sessions included Geotechnical, Transportation and Water; the afternoon sessions included Industrial, Legal & Ethics, and Technology. Attendees were free to attend sessions from any of these tracks and mix and match according to their interests. Based on the overwhelmingly positive feedback, ASCE and ESWP will definitely be hosting another PDH Boot Camp; so, keep your eye out for more information in the upcoming year! A lot of people helped make this event possible: thanks to everyone who volunteered on the program committee and as a speaker! Click here for the full brochure. Finally, one last big thank you to all of the sponsors that supported this event! By Vishal Patel, M.S.C.E., P.E., Todd DeMico, P.E., and Sebastian Lobo-Guerrero, Ph.D., P.E. Common techniques for stabilizing large scale slopes (i.e. rock toes, buttresses, soil nails, retaining walls, etc.) are sometimes impractical from both a constructability and stability point of view. Slope stabilization with deep foundations, while effective, are not widely used due to a lack of published standardized design procedures. 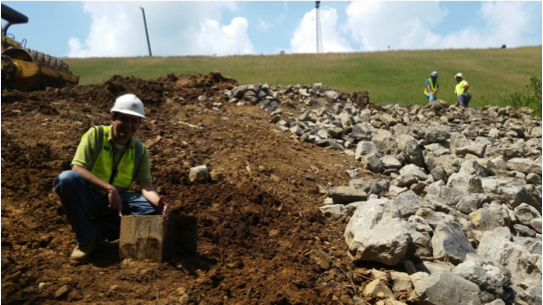 American Geotechnical and Environmental Services (A.G.E.S. ), Inc. had the opportunity to design an embankment stabilization system using drilled shafts. Drilled shafts were chosen for the site based on unique construction conditions and the overall scale of the proposed embankment. A.G.E.S., Inc. was also involved during construction of the project and had the opportunity to observe the general performance of the system. 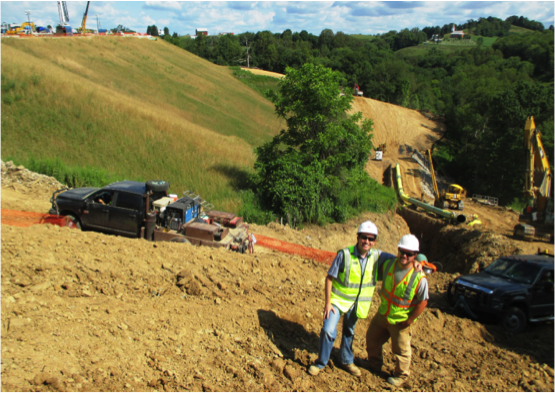 This case study involves the installation of a pipeline at the toe of an existing 110-foot-tall embankment (see right) constructed within a known ancient landslide. Construction for the project required excavation for the pipeline in addition to a 50 foot wide bench near the existing toe for construction access. In order to accommodate the bench width, an additional 45-foot-tall embankment below the existing 110-foot-tall embankment needed to be constructed. The size of the embankment and the inherent weakness of the soil within the ancient landslide required consideration of techniques beyond the traditional slope stabilization methods to meet an acceptable factor of safety and a very limited time frame for construction. 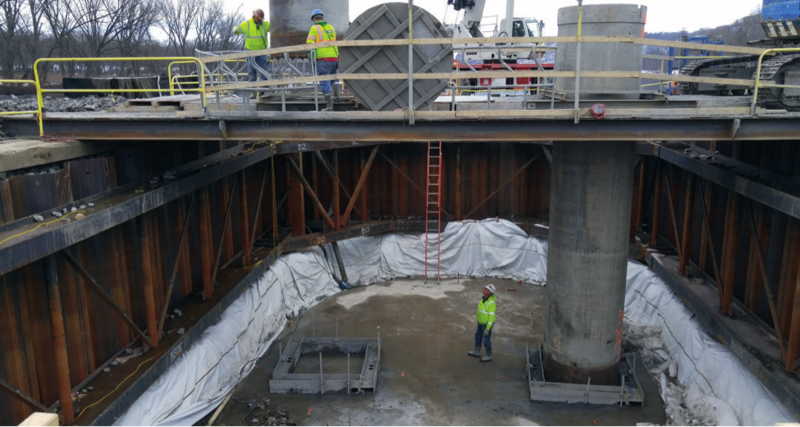 A total of 75, 3-foot-dimeter, drilled shafts reinforced with W beams, embedded into bedrock, were designed and constructed in 3 rows along the embankment to provide adequate stabilization. Analyses for excavations along the proposed final slope were performed along the existing embankment. The analyses were performed to ensure the pipeline excavation, the 50-foot-wide by 300-foot-long bench, and the proposed treatments below the pipeline, would not result in instability of the existing embankment. The space for the bench resulted in the final slope extending approximately 45 feet lower in elevation to reach flatter grade. As a result of the bench, the pipeline was to be installed in a backfilled excavation consisting of both the upper 110 foot tall existing embankment and the 45-foot-high stabilized embankment. The slope at the lower portion was to maintain the 1.3H:1V orientation of the existing ground surface. Drilled shafts were proposed to minimize disturbances to the existing soils. 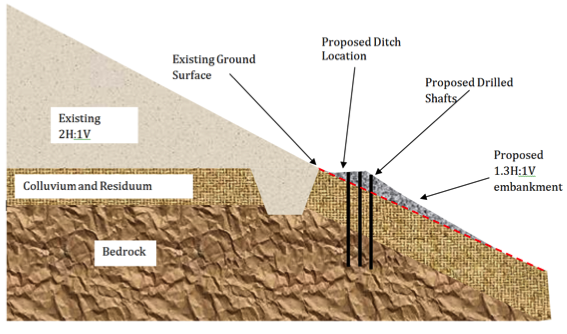 Design for the proposed slope retrofit consisted of performing geotechnical and structural analyses for both global stability of the proposed treatment and lateral analysis of the proposed drilled shafts. The two analyses were performed sequentially to ensure that the proposed layout satisfied these geotechnical and structural requirements. Stability analyses were performed using SLIDE for both the upper slope (the existing embankment above the pipeline) and the lower slope (the proposed slope treatment region below the pipeline). The slope treatments were designed to satisfy a factor of safety of 1.3 for the temporary condition and 1.5 for the permanent condition. These analyses were performed to ensure that the proposed embankment work would be stable for both construction and permanent conditions. In an effort to minimize soil disturbances at the toe of the slope, rigid elements (drilled shafts) were chosen as the preferred option. The drilled shafts were modeled in SLIDE as a resisting force. Based on the required resistance, the pile layout was determined from the SLIDE analyses. Lateral analyses (p-y model) were performed using LPILE in order to size the rigid elements and ensure drilled shafts extended deep enough in order to satisfy a fixed condition. The drilled shafts consisted of W-piles encased within concrete (see left). Bending and shear resistance were analyzed considering the 50 ksi steel piles only. The analysis considered a spacing of the drilled shafts along each row equal to three times the drilled shaft diameter (3xD) in order to maximize passive resistance due to soil arching. The spacing in between rows was chosen to avoid “shadowing” and group effects that could potentially reduce the shaft resistance. The design procedures for stabilizing slopes with deep foundations such as drilled shafts are still in their infancy. Although several publications exist for this stabilization technique, none are widely accepted nor considered design standards. This manuscript described a simplified design procedure based on global stability and lateral deformation analyses as suggested in the literature (for example FHWA and ODOT design manuals). A.G.E.S., Inc. was able to witness the constructability of this design alternative and did not find any indications of instability. This suggests that the implemented design procedure provides and adequate factor of safety. As projects like these begin to gain momentum, particularly in the public sector, the procedures for design will become more common. A manuscript describing in detail the implemented design procedure is being developed by the authors and it is expected to be presented at ASCE-GI/DFI/ADSC/PDCA International Foundations Congress and Equipment Expo (IFCEE) 2018 in Orlando Florida. More than 60 ASCE members and guests gathered at Cefalo’s Restaurant on Thursday, October 19th for an ASCE Pittsburgh Section Geo-Institute Chapter meeting. As part of the meeting, Mr. Martin Derby, a senior geohazard practice leader with Golder Associates, presented the lecture “Performing Geohazard Assessments and Pipeline Monitoring Methods.” The presentation focused on assessing geohazards, including unstable slopes, seismic events, subsidence and hydrotechnical (water erosion), which have the potential to adversely impact infrastructure, including pipelines, in the Appalachian region. Performing geohazard assessments along pipeline corridors assists owners and operators in determining if a natural hazard may impact their assests. Mr. Derby went on to outline a three-phase approach used to identify, characterize and ultimately mitigate/monitor potential geohazards. Phase I begins with a regional-scale desktop assessment to identify, initially characterize and qualitatively classify geohazards. Phase II involves a non-intrusive ground reconnaissance completed at targeted sites that warrant additional assessment. Finally, Phase III involves subsurface investigations such as drilling, test pitting or geophysical surveys carried out at specific sites of concern. Phase III also involves the collection of sufficient data to plan for and design site specific mitigation and/or monitoring such as in-situ pipeline monitoring (e.g. strain gages), slope monitoring (e.g. inclinometers, tilt meters, etc. ), InSAR (satellite and ground based), LiDAR (airborne) and fiber optics. Overall, Mr. Derby’s presentation illustrated how important assessing geohazards can be for a client to determine if a natural hazard may impact their assets. Geo-Institute is grateful to Mr. Martin Derby for sharing his experience and depth of knowledge on this subject as well as to Cefalo’s for their delicious food and great atmosphere. 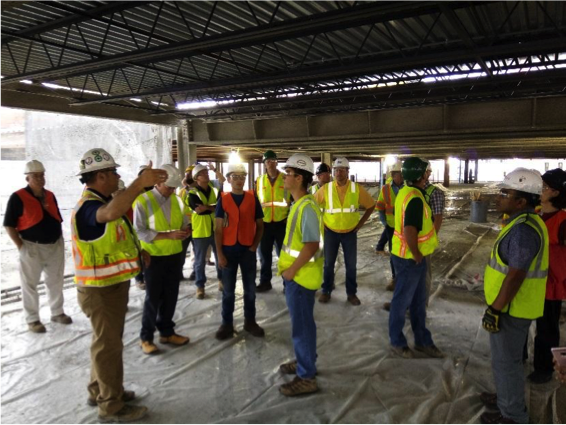 September 15, 2017 marked the Annual American Institute of Steel Construction (AISC) SteelDay Construction Tour presented by the Pittsburgh SEI Chapter. SteelDay provides the opportunity for individuals from various professions and expertise to see how the structural steel industry contributes to building America. This year’s tour was in the Oakland neighborhood of Pittsburgh at the new Empire Apartments Building (Empire Building) mixed-use building complex. The Empire Building is a 17-story structure with a six-story parking structure holding 381 parking spaces. There will be 723 apartments of one, two, and three-bedrooms with amenities such as in-suite washers and dryers, granite countertops, “robust” internet and WI-FI, a pool and patio entertainment space, and even a golf simulator. The building will also have 10,000 sq. ft. of retail space on the ground floor. 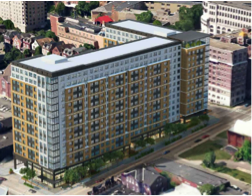 The structure boasts great views of adjacent neighborhoods, such as East Liberty, Shadyside, Bloomfield, Lawrenceville, and Oakland and the Universities. 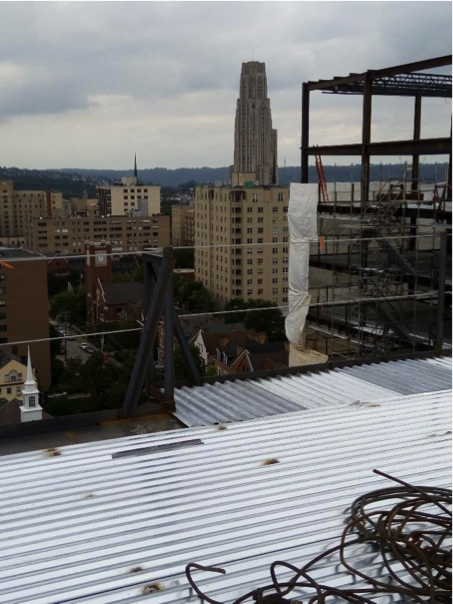 Tour participants were able to witness some of these views from the 16th floor level, which included great photo opportunities of the Cathedral of Learning, which were particularly appealing to University of Pittsburgh alumni attendees. Approximately 35 participants met at the construction field office adjacent to the site to begin the tour. Project managers and members of the team talked about the speed of construction and the requirement to adhere to the project schedule. This included one important detail: Staging of the materials brought on site to minimally impact traffic in Oakland. This was accomplished by closing off a side lane of Centre Avenue thus allowing trucks to deliver materials out of the traffic’s way and then to exit onto the roadway after delivery. The construction began in the spring of this year, and through a time-lapse video everyone witnessed the expeditious foundation and steel construction to date. You can also view the same time-lapse video highlighting the building’s progress. Attendees also learned that the entire project is being built directly by companies here in Pittsburgh. Sippel Fabrication (Sippel) is the steel fabricator for the project. As some of the SEI members may remember, a past SteelDay event included a tour of Sippel’s facility in Ambridge, PA. Century Steel Erectors (Century Steel) is conducting the building erection and the Massaro Construction Group (Massaro) is the construction manager for the project. Through their collaboration, these three firms showcase Pittsburgh as a leading 21st century “Steel City.” Their work focuses not on past laurels but rather on what is now and what is yet to come in Pittsburgh’s skyline. 2017 was another successful year for SteelDay’s mission: to gather individuals from various industries to share how the Steel Industry contributes to building America. I thank our generous hosts, Massaro, and the local contributors, Sippel and Century Steels for a job well done! 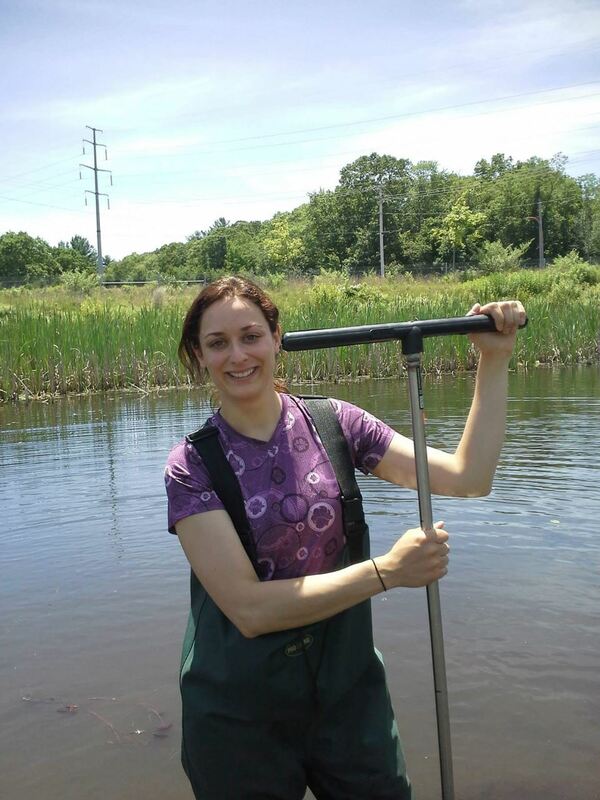 While Dr. Oyanedel -Craver was driven to increase research in this subject, she also recognized the worldwide lack of women in leadership positions in the water sector, both in academic and industry. “Without women in leadership positions in the water sector and policy, it is not possible implement development strategies that can benefit everyone,” she explains. Dr. Oyanedel -Craver set out to increase awareness of the effect of water on the community, while also promoting women in leadership. She became one of the founding members of the Women-Water Nexus (WWN) Committee at the ASCE Environmental and Water Resource Institute. 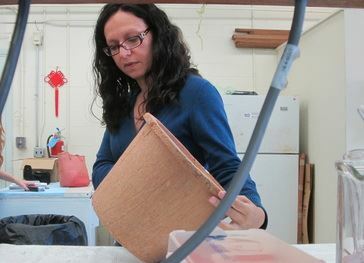 Now, she is the Chair of the Women-Water Nexus, which aims to develop a network of women scientists and engineers in developed and developing countries that promote research in water treatment and water resources. The group also focuses on the education of future women scientists and engineers. T he Women-Water Nexus, still in its early phase, is currently recruiting members, and planning its first few programs. “We are starting to develop our network, hopefully by early next year we can start our mentoring program and support activities looking to create gender inclusive training for the water sector,” Dr. Oyanedel-Craver says. One of the aspects of this mentoring program will be to give women assistance and feedback on preparing presentations for international conferences. The Women-Water Nexus is also hoping to perform an international survey to inform them on the current number of women leadership positions, the pathway they took to get there, and the common hurdles. “Bringing this information to light can hopefully inspire the next generation of women to aim high,” Dr. Schifman says. Both Dr. Oyanedel-Craver and Dr. Schifman hope the Women-Water Nexus will grow into a vibrant community that provide support to women around the world achieve their full potential. If you are interested in participating with the Women-Water Nexus, visit the Women-Water Nexus website for more information. 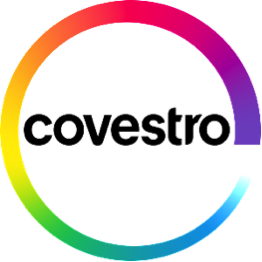 Predicting Geotechnical Drilled Shaft Capacity: Are We Close? Recently modified design equations used in the transportation industry to calculate side friction and end bearing capacity for drilled shafts are now providing more realistic estimations of capacities than did previous methods. Using multiple case studies and test results from various projects, a more realistic design approach was formulated by the Federal Highway Administration (FHWA), which resulted in greater values of ultimate capacity for side friction and end bearing and in a more efficient design overall. In 2010, the FHWA published GEC-10 – Drilled Shafts: Construction Procedures and LRFD Design Methods, which illustrates a different method of calculating side friction and end bearing resistance and results in greater values for design. In 2014, the Association of State Highway and Transportation Officials (AASHTO) adopted the method put forth by FHWA, which was included in its LRFD Bridge Design Specifications, 7 Edition. The Pennsylvania Department of Transportation (PennDOT) recently adopted and incorporated the similar methodology as AASHTO for calculating side friction and end bearing for drilled shafts in rock, and these changes are reflected in the 2015 edition of the PennDOT Design Manual, Part 4 (DM-4). This article discusses the past and current design methodology along with a project case study with results from Osterberg Cell (O-cell) load testing, which presents a comparison between the design resistances of ultimate side friction and end bearing and the measured capacities at failure. 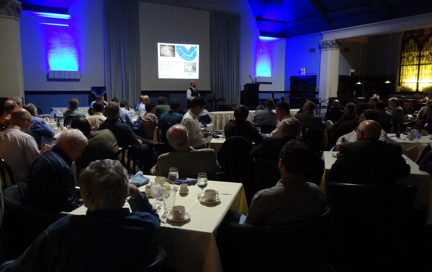 In May, the Continuing Education Committee for the Pittsburgh Section of the American Society for Civil Engineers hosted the leadership training seminar Performance DISCovery at Roland’s Seafood in the Strip District. Presented by national speaker and renowned performance consultant, Chris Flickinger, the seminar coached ASCE members how to use advanced behavioral science to get farther, faster and be more effective during their interactions with others. Internationally ranked among the top 1% of performance consultants in the world, Flickinger works with large Fortune 500 companies as well as family-owned businesses and mid-sized companies. 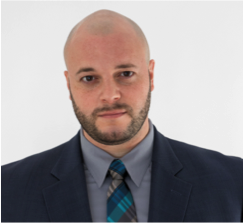 Chris’ background includes the Fox News Channel, Dale Carnegie Training (former leadership training instructor), the Pittsburgh Steelers, Pittsburgh Pirates, and Psycho-Metric Analysis and Positive Psychology Coaching under the guidance of Harvard’s world famous professor, Dr. Ben Tal-Shahar. Attendees learned techniques and honed their abilities through group interaction to quickly “read” and adapt to people to easily anticipate and connect to their interests, needs, wants, challenges, and expectations using DISC personality traits and identifiers. From simple things, like a person’s style of dress or grooming to mannerisms and word choice while speaking, these and other identifiers provide clues as to that person’s dominant DISC personality profile. 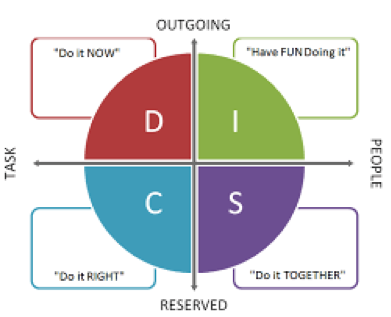 Once you’ve identified the dominant DISC personality profile, you’ll gain insight into the best way to modify your sales pitch or negotiation tactics by addressing those aspects of the conversation your receiver cares about most. By learning these skills, the attendees increased their negotiation power and leadership potential during business and interpersonal interactions. Twenty-seven attendees received attentive instruction and practiced what they had learned in group role-playing exercises during the three hour seminar over dinner, earning 3 PDH credits. Feedback from the group was overwhalmming positive. with numerous requests requests for additional material from our presenter. “Chris is very knowledgeable and very good at presenting the material in a way I could understand,” said one participant. “This was by far the most useful/beneficial professional seminar I've attended,” another participant added. The ASCE Board graciously sponsored the event by defraying the cost of a national speaker and allowing the Continuing Education Committee to offer Chris’s insightful instruction at a reasonable cost to members. Performance DISCovery comprises part one of a three-part lecture series Flickinger has developed on leadership in the professional arena. Keep an eye on the Upcoming Events section of your ASCE Pittsburgh Section e-mails for the announcement of the second installment of our leadership training series presented by Chris Flickinger in the spring of 2018. On August 4-6, 2017, the ASCE Committee on Younger Members hosted the annual Younger Member Leadership Symposium (YMLS) at the ASCE headquarters in Reston, VA. Younger Member Forum (YMF) members Max Wallack, E.I.T. (YMF Community/Outreach Chair) and Edward Major II, E.I.T. (YMF Technical/Employment Chair) had the opportunity to represent the ASCE Pittsburgh Section at this year’s event. The conference brought together nearly 50 younger members from across the nation to network, learn about different communication and personality styles, and discuss the hot issues facing the civil engineering profession today. Offer something, such as special certifications, in addition to the professional license that, when held in conjunction with the license, will equal the current body of knowledge definition. Option 2 is currently being explored by ASCE through lobbying of state legislatures. This option, in its current form, specifies a master of science or 30 credits of coursework beyond the bachelor of science as requirements to sit for the P.E. exam. Efforts have been made in several states to reach out to the local ASCE sections and branches, and even legislators themselves. Although this is the direction that ASCE is currently pursuing, the other two options and potential others could prove valuable as well. 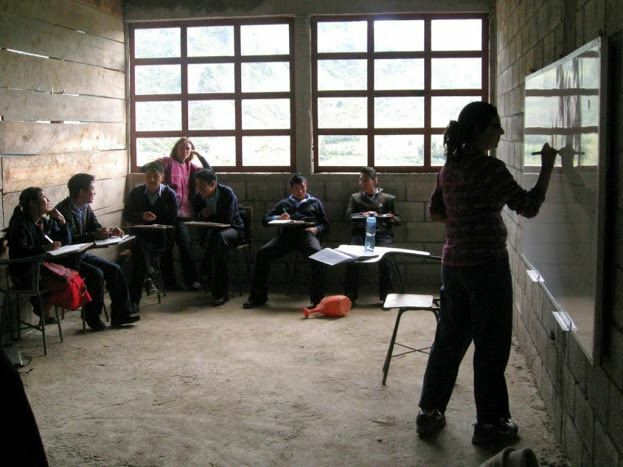 It is our hope that the feedback offered by Edward and others will help ASCE proceed successfully. During the technical tour, ASCE younger members toured the capital building with former Representative Bob Carr and visited the ASCE Government Relations Department in Washington, D.C. The ASCE Government Relations Department advocates for infrastructure, sustainability, and education and licensing requirements for civil engineers. ASCE encourages younger members to attend the Legislative Fly-In to meet with members of Congress to discuss ASCE initiatives in-person and gain valuable experience interfacing with government. A more in-depth explanation of these four styles can be found here. Edward determined that his personal communication style can be classified as Analytical-Amiable. Analyticals are classified by a desire to always know the correct answer, to always have all the facts in front of them during a discussion, and are sometimes seen as rather detached. Amiables are typically very approachable and cooperative, good listeners, and tend to use opinions more during discussions. Max identified his personal communication style as Analytical-Expressive. 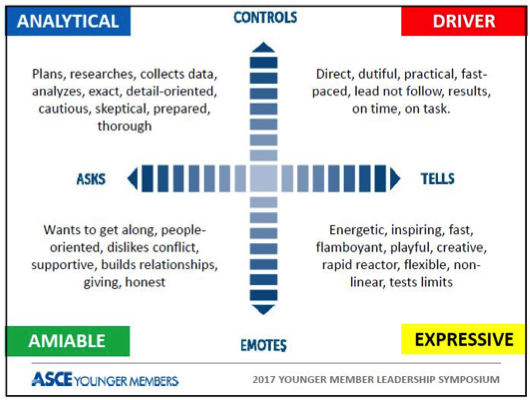 Expressives are enthusiastic, approachable, want to develop relationships, and are sometimes seen as impractical or make quick decisions based on emotion. 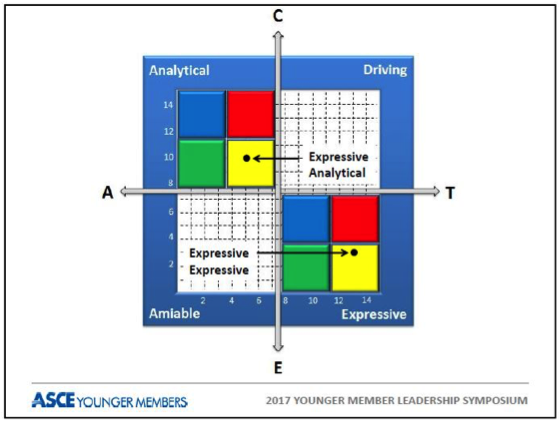 The last style, Drivers, which neither Edward or Max identify as, is generally classified by being organized, decisive, and sometimes critical of work. Other topics of interest during the weekend were negotiating skills, work-life balance, difficult decisions, and a mentorship panel consisting of vice presidents, directors, and project managers from various public and private entities. The panel responded to a series of questions from younger members. The advice from these mentors was relatively consistent across the board – most recommended joining multiple professional organizations, learning to communicate across multiple generations, and presenting information concisely. As the demand for energy grows and the human impact on natural resources like fresh water becomes more profound, public and private entities are relying on environmental engineers to address current and future challenges facing our society. In order for its students to capitalize on this changing job market, the University of Pittsburgh’s Swanson School of Engineering offered a new environmental engineering major beginning the 2016-2017 academic year, and plans to seek ABET accreditation in October, 2017. The degree launched in the fall of 2016, and the first graduates adjusted their course requirements to graduate in April 2017, says Leonard Casson, associate professor and academic coordinator of the Department of Civil and Environmental Engineering. The environmental engineering major joins bioengineering, chemical and petroleum engineering, civil engineering, electrical and computer engineering, industrial engineering, mechanical engineering, materials science engineering, and engineering sciences in the Swanson School. According to recent BLS data, “employment of environmental engineers is projected to grow 12 percent from 2014 to 2024, faster than the average for all occupations.” California, Pennsylvania, New York, Florida and Texas currently lead the U.S. in the highest employment level of environmental engineers. Casson added that there are currently 67 ABET accredited environmental engineering programs in the United States. And, locally, he continued, environmental engineers—who use the principles of engineering, biology, and chemistry to develop solutions to environmental problems—will likely have job opportunities in many professional areas including water and wastewater treatment, site remediation, solid and hazardous waste management, energy, green building design and construction, and mining. The Department has approximately 300 undergraduate students (sophomore, junior and senior) and 150 graduate students (MS, PMS and PhD). It is also one of Pitt’s oldest academic programs, established in 1867 as a direct result of the impact of the civil engineering field during the Civil War. 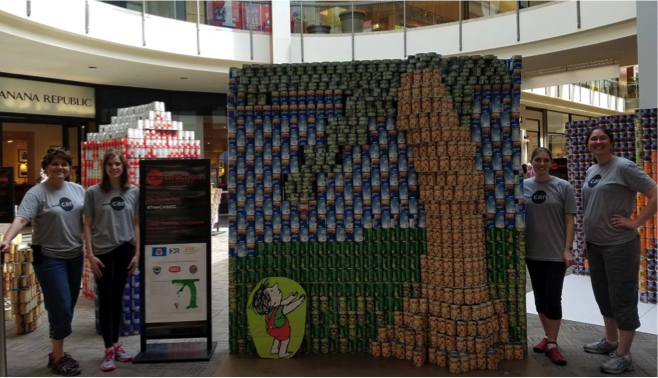 For the fifth year in a row, the Pittsburgh Younger Member Forum teamed up with the Keystone-Mountain-Lakes Carpenter’s Union to enter the annual CANstruction Pittsburgh competition. This year’s entry “Giving Everything to End Hunger” was a 3D version of the cover of Shel Silverstien’s classic book “The Giving Tree”. The design was selected to fit with the competition theme of “Food for Thought.” Constructed over the course of six hours by Karen Mueser, Linda Kaplan, and Erin Feichtner of the YMF along with members of the Carpenter’s Union, the display was eight feet wide and eight feet tall with the tree and leaves projecting out. It all starts with a sturdy trunk of potatoes sitting on a verdant hill of spinach, green beans and peas. The sky comprised of chicken broth and a variety of beans. The tree’s canopy comprised of almost 500 cans of tuna – that’s nearly 140 pounds of fish. Perhaps the best part of CANstruction is the cause. All of the cans used in the structure were donated to our food bank partner, The Brashear Association, which is located in Pittsburgh’s Southside. With more than 2,000 cans of food weighing over 1,600 pounds, this Giving Tree will live up to its name, providing many meals for the families of Pittsburgh. We are pleased to be donating so much good food to the members of our community that need it. 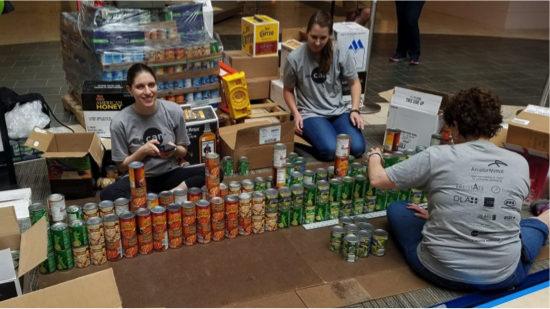 While CANstruction is ultimately a food charity, there is a healthy dose of competition between the teams and six awards from the ‘Best Use of Labels’ to ‘Fan Favorite’ were up for grabs. This year, “Giving Everything to End Hunger” won the 2017 award for “Juror’s Choice” as the favorite of the 5 local judges. The structure will now go on to compete in the National level competition via photos. We would like to extend a special thanks to everyone that donated to the project including: friends, family, and members of the ASCE Pittsburgh Section, Giant Eagle Parkway Center, The Greater Pennsylvania Regional Carpenters Unions with special thanks to Locals 443, 432 and 441, Civil and Environmental Consultants, Inc., and HDR.